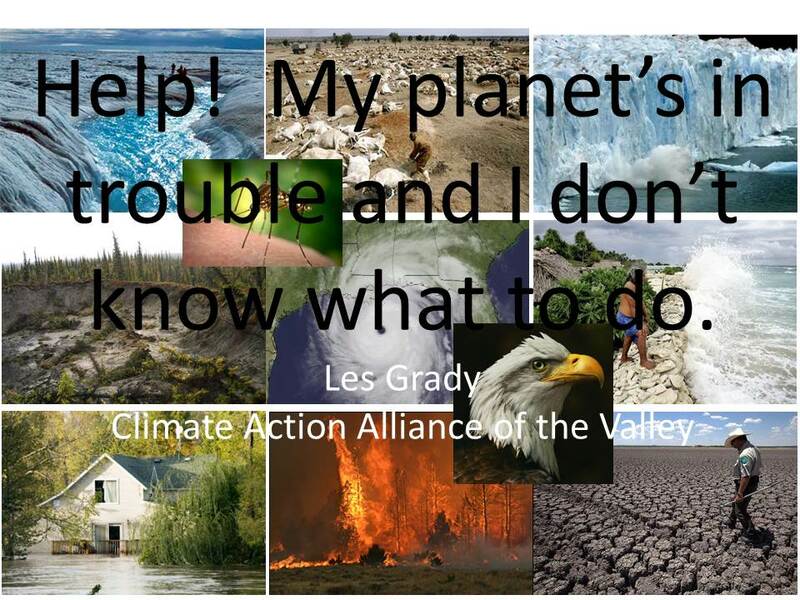 CAAV member and former steering committee chair Les Grady presented a talk about climate change at the Massanutten Regional Library, downtown Harrisonburg, on Monday, April 20, 2015, entitled Help! My Planet’s in Trouble and I Don’t Know What to Do. The Daily News-Record‘s Elaina Sauber was there along with photographer Nikki Fox. The below article was published in the Daily News-Record on Tuesday, April 21, 2015. Photo by Nikki Fox for the Daily News-Record, April 21, 2015. HARRISONBURG – Les Grady thinks the first step to slowing down climate change is simply talking about it. The licensed professional engineer, who has taught environmental engineering at Purdue and Clemson universities, spoke to about 30 people Monday about addressing and alleviating the effects of climate change to commemorate Earth Day, which is Wednesday. The event was held at Massanutten Regional Library’s main branch in Harrisonburg. Grady has also worked part time for the last two decades for CH2MHILL, the world’s largest environmental engineering consulting firm. While 97 percent of climate scientists agree that warming trends of the last century are likely due to human activities, he said, a new study from Yale University shows that only 52 percent of Americans are concerned about climate change. Skeptics argue that the Earth experiences natural shifts in climate, and any perceived changes aren’t being driven by the burning of fossil fuels. 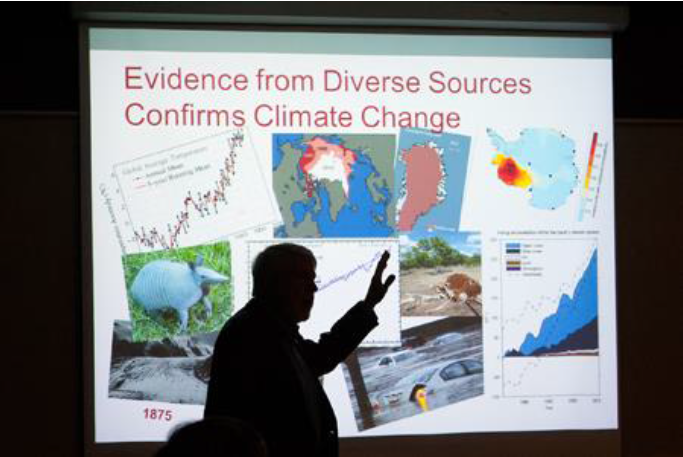 Grady said the first thing to recognize when it comes to climate change is that a variety of research sources confirm its existence – not just temperature records. “In fact, temperature records are probably the least reliable in the sense of indicators,” he added, due to natural variability and the fact that only about 1 percent of the Earth’s heat is in the atmosphere. The oceans contain most of the planet’s heat. According to research from the National Oceanic and Atmospheric Administration, oceans’ heat content has risen almost continually since the mid-1990s. Accepting climate change as reality also means accepting the role carbon dioxide plays in exacerbating it, Grady said. As rising carbon dioxide levels contribute to higher temperatures, precipitation and sea levels also increase, Grady said. “The more carbon we put into the atmosphere, the warmer it’s going to be,” he said. Developing countries in Africa, South America and Indonesia are more vulnerable to issues stemming from climate change because they don’t have the economic resources to deal with the problems it presents, Grady said. “Many people say this is a moral and ethical question, because their contributions to the problem are negligible – they haven’t emitted very much carbon dioxide,” Grady said. Grady listed steps people can take to help address climate change in their own lives. In Virginia, he said, transportation is the major source of carbon dioxide emissions, followed by electricity generation through the burning of coal. While anyone can make changes to their transportation and electricity use, Grady said the political process is crucial in persuading energy providers to follow suit. He also encouraged attendees to calculate their carbon footprint using programs found on the Environmental Protection Agency’s website. But the main course of action Grady advocates is implementing a carbon fee and dividend. “We allow all of us to dump the waste from burning fossil fuels into the atmosphere,” he said.